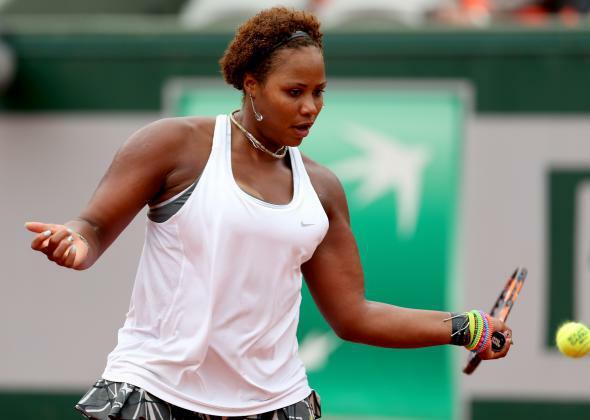 Taylor Townsend carves through the French Open draw despite USTA concerns about her weight and fitness. Taylor Townsend returns a shot during her match against Alizé Cornet of France. Taylor Townsend, the American teen tennis phenom, just won her second-round match at the French Open against No. 20 seed Alizé Cornet. The upset is noteworthy because Townsend, ranked No. 205 in the world, is making her Grand Slam main draw debut at Roland Garros. It’s also significant because Townsend was at the center of a momentary maelstrom in 2012 when the USTA declined to fund her trip to the U.S. Open because of her weight. Townsend had just won the junior Australian Open, catapulting her to No. 1 in the world among junior girls. But citing concerns about her “long-term health” and “long-term development as a player,” USTA general manager Patrick McEnroe chose not to pay her airfare or to finance any tournament appearances. That kerfuffle led to Townsend parting ways with her USTA coaches and teaming up with former star Zina Garrison and a childhood mentor, Kamau Murray. “It made me stronger as a person, it made me stronger as a tennis player,” she told the New York Times earlier this week about the ordeal. Watching Townsend carve a path through the clay-stained draw is a pleasure. Though younger players often do struggle with fitness—especially those who are just transitioning from the juniors into the pros, because the demands are so sky-high—that doesn’t mean bodies have to serve as proxies for speed or conditioning. What’s clear today is that Townsend’s heavier physique isn’t holding her back in the way McEnroe feared it might. And wishing for an alternate reality in which the up-and-comer had a more slender build or 15 fewer pounds seems off base. What if Simona Halep were four inches taller? What if Maria Sharapova could detach her arms at the shoulder? Meanwhile, in a strange bit of symmetry, dependable U.S. juggernaut Serena Williams is out of the French Open after losing 6–2, 6–2 to Spain’s Garbiñe Muguruza. Serena’s older sister Venus also lost on Wednesday. When the Williams sisters started their careers in the 1990s, the women’s tour counted few black players. (Serena, who’s been compared to a Mack truck, is no stranger to body-snarking.) Now, that’s totally changed. In addition to Townsend, the brightest light among American women is Sloane Stephens, who’s also still alive in the French Open draw.